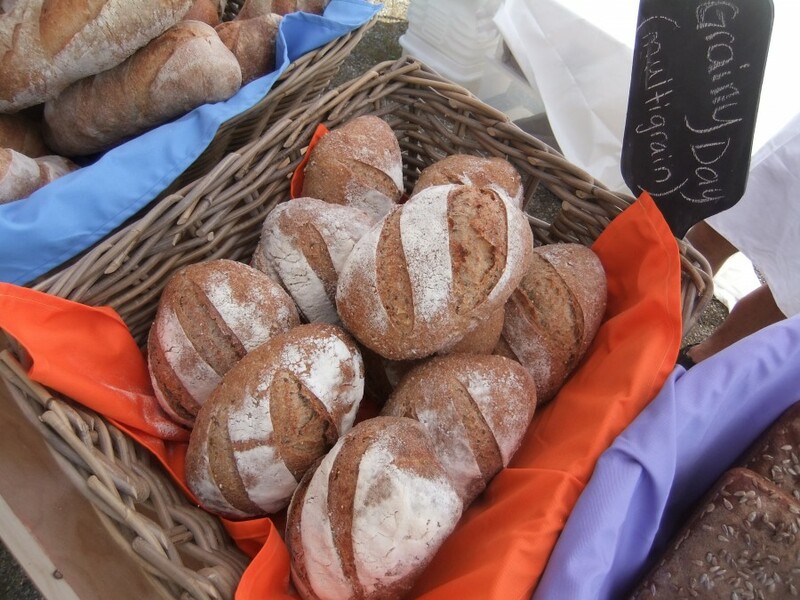 Yesterday was the first EVER Wells Farmer’s Market in Wells. 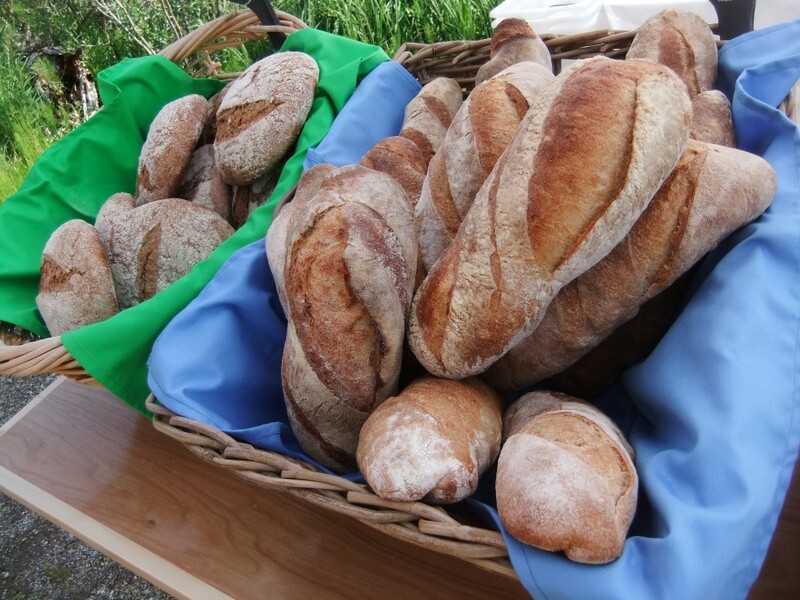 We nearly sold out of our bread – over 80 loaves sold! 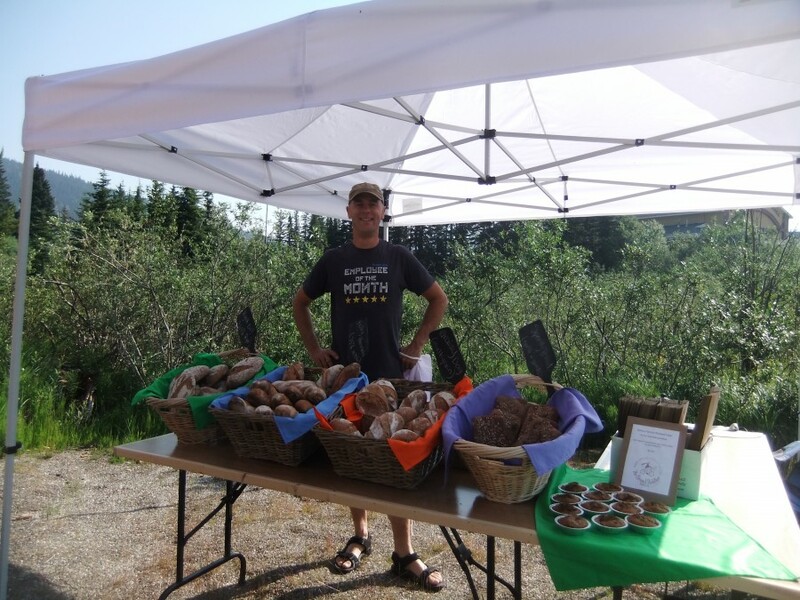 – and there were jams, pickles, preserves, pancakes with huckleberry compote, coffee, garlic scapes, mini rhubarb cakes, smoothies, lemonade and all sorts of things! There was even a lamb to feed and pet. She did a great job pruning the grass around the gazebo. It was fun and it felt good to earn some money for the first time in a little while. The townsfolk of Wells came out in good numbers to support the market. I’m sure it will grow into a great market. 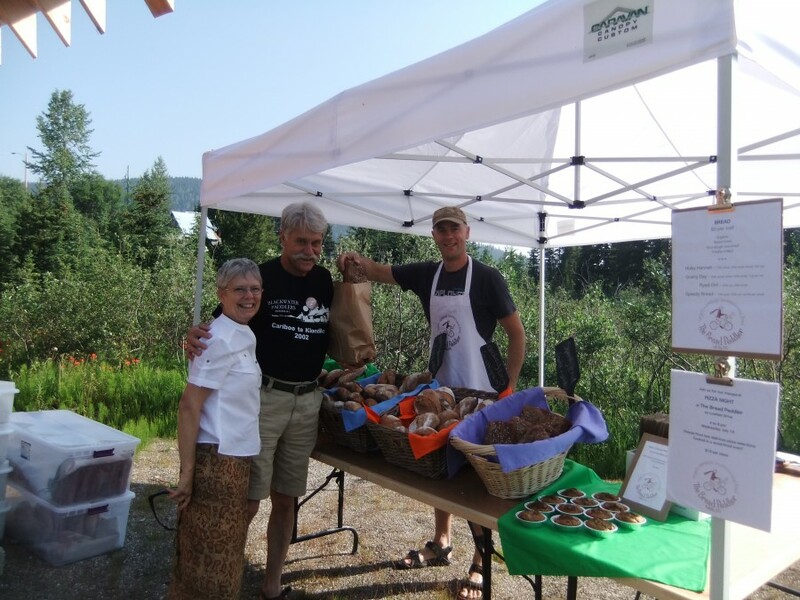 Next markets are July 27, August 10 and 24, and September 7 and 21. Congratulations to everyone involved in the Wells Community Association – the organizers of the market. We have had 3 firings of the oven so far, and each time we are getting more heat of the oven. This morning the oven is still reading just over 300°F, and there hasn’t been a fire in there for nearly 48 hours. 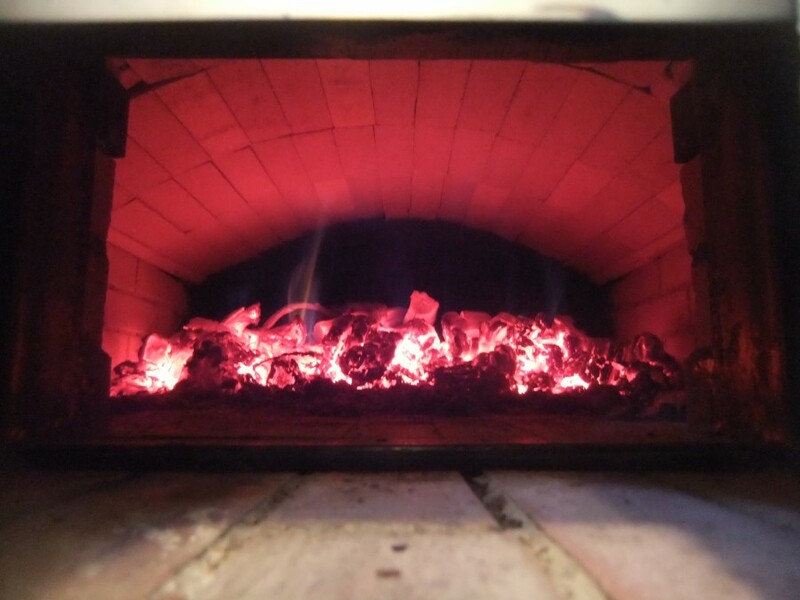 A hot bed of coals inside the oven – I think we are getting the hang of this firing thing. Holey Hannah Bread, take II, and our friend Catherine in the background watching the proceedings. Our first customers, 8:55 am Sunday at the first Wells Farmer’s Market. 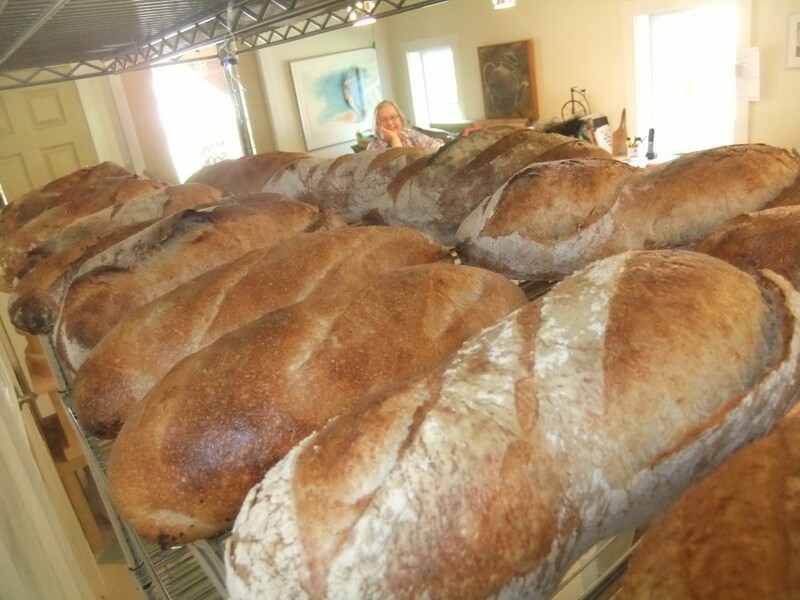 Jeff and Margaret bought one of each kind of bread! I hope they have hungry friends. Bread on display at the market. 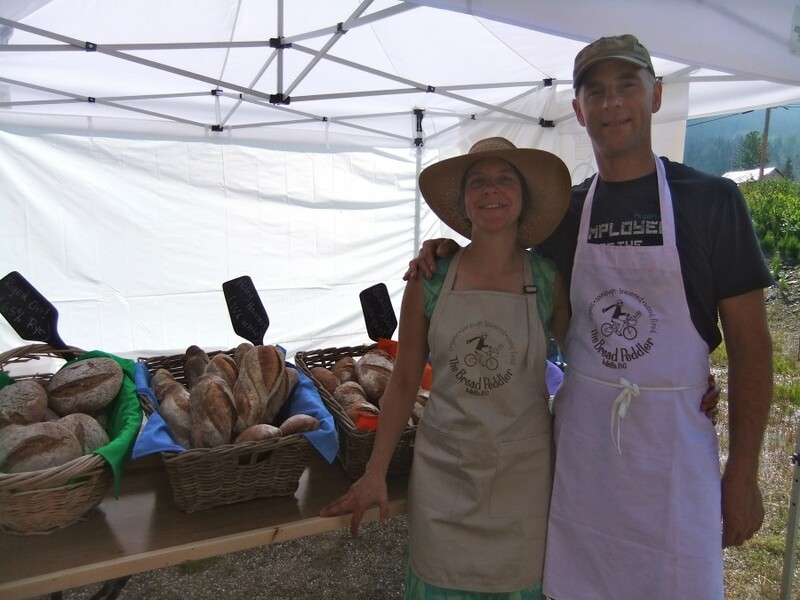 Two proud and relieved Bread Peddlers. Tim proudly displays his “Employee of the Month” T-shirt. I don’t know where he gets the idea that HE is Employee of the Month, surely it must be ME. Kate – you are an inspiration! I’m almost jealous. Looks like dough is the way to go. Yay! I’m so thrilled about the farmer’s market! Your booth looked so beautiful and classy, I wish I could buy one of every kind…soon enough! Great job guys! Wow! A lot has happened since we last saw you 🙂 Congratulations on the bakery and even more importantly…being in the dough. You two really are amazing. Can’t wait for more updates now that I found the new blog. Awesome news! 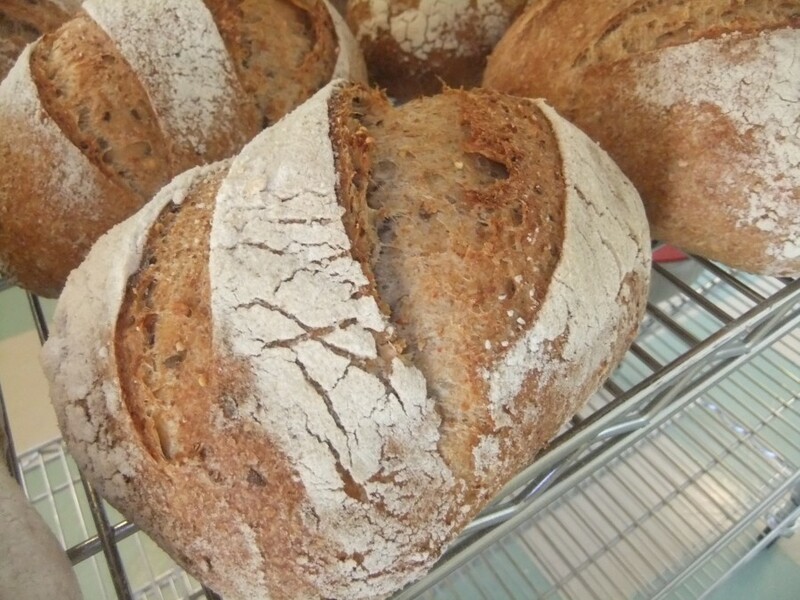 The bread looks amazing, the oven incredible and both of you happy. So wonderful to see your dream in action!